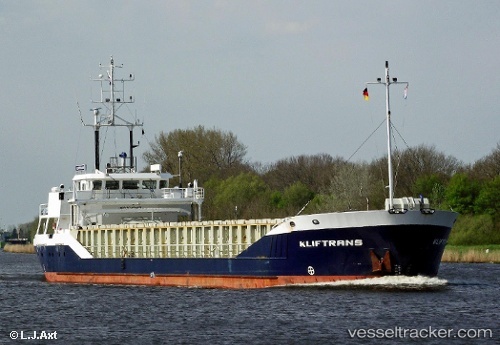 In the morning of Jan 6, 2011, at 7 a.m. the 25-m-f/v "Valentina" which had departed from its homepor Marzaro at 3.30 a.m. and was bound to Pantelleria, was in collision with the "Kliftrans" which was underway from Turchia to Cardiff. The Coastguard from Mazara del Vallo was soon on scene at the accident site 30 miles south of Lampedusa. 3 of the crew of 7 of the "Valentina" were injured and had to be saved by the patrol boat "CP 850". The men from Tunesia and Sicilia were medically treated in the hospital Abele Jello, and two of them meanwhile released. The trawler which suffered water ingress through a large hole in the bow was dewatered, and at 12.30 a.m. the casualty reached Trapani, escorted by the f/v "Mamma Maria". The "Kliftrans" was directed to Porto Empedocle. Prosecutors from Marsala stared investigations since.